Faye Dunaway has broken her silence about the Oscars Best Picture flub in an interview with Lester Holt on “NBC Nightly News” on Monday. “I could have done something, surely. Why didn’t I see Emma Stone’s name on the top of the card?” Dunaway said, adding that she feels “very guilty” about the mix-up. Dunaway, who incorrectly announced “La La Land” as the Best Picture winner over “Moonlight” alongside co-presenter Warren Beatty, also walked through what was going through her head on stage. At the ceremony last February, Dunaway and Beatty were handed the wrong card as they were entering the stage to present the final award of the night. 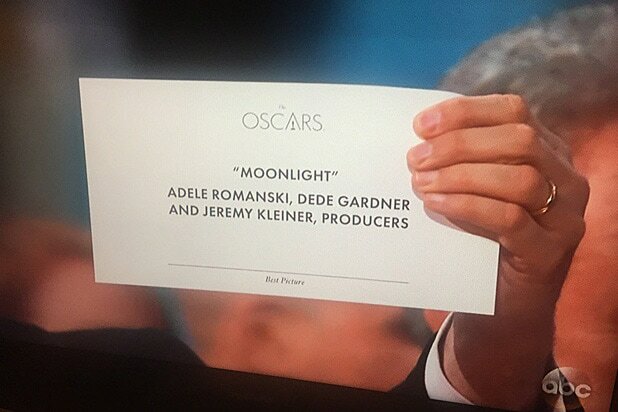 Beatty was given a duplicate card naming “La La Land” star Emma Stone the Best Actress winner, which Dunaway mistakenly interpreted to mean the film had won Best Picture. The mix-up forced producers to step in and announce Barry Jenkins’ “Moonlight” as the rightful winner after the cast and producers of “La La Land” were already on stage to accept an award they hadn’t won. “We were — I won’t say deers in the headlight — but you are completely stunned. You don’t know what has happened,” Dunaway said. Holding her own Oscar in hand, Davis is clearly thrilled for everyone involved with "Moonlight" -- as is her husband, Julius Tennon. More than anyone, Streep was absolutely floored by the Oscar stage Best Picture flub. Henson was filming the moment on her phone, but couldn't wipe the shocked look off her face as "Moonlight" won. Both Kidman and Keith Urban were ecstatic to hear the "Moonlight" news. Washington's face conveyed nothing but pride as the "Moonlight" cast and crew took the Oscar stage. It's possible Philipps could be more thrilled at "Moonlight" taking Best Picture, but it sure doesn't look like it. From the Oscar stage, Monae celebrated the "Moonlight" win, putting into action the feelings of a huge number of people across the Internet. Damon broke out the two-finger dad whistle to share his approval of the "Moonlight" win. Spencer beamed over the "Moonlight" win, adding her applause. The Rock is all smiles as the Best Picture announcement goes out. The angle was a bit obscured, but Jackson took a photo with his phone of the amazing Best Picture moment, and then appeared to wipe away a tear.